Gift baskets are easy to assemble, and the final result is stunning. Suitable for any occasion, unique gift baskets are just the solution when you can't decide on a specific gift item, and just about everybody loves receiving a basket. You can use any shape basket with or without a handle. The size depends on what you want to put into it. Choose a basket theme tailored to the recipient. Try to focus on the individual's interests and select a theme appropriate for them. Then, select several items that complement one another and the theme. Any gift basket is fun to open, so don't stress over the contents. The available options are numerous, but here are a few examples to get you started. For a golfer, fill a basket with golf tees, golf balls, a small towel, sunscreen and other related items. For a gardener, use a selection of hand gardening tools and seed packets. For a reader, pick several paperback books in a genre the recipient enjoys. Add a small book light and bookmarks. For a new homeowner, fill a basket with a DIY book, small tools, duct tape and paint brushes. For your favorite knitter/crafter, stock the basket with items the recipient uses in their hobby along with a book on the subject. For a bird watcher, seeds, binoculars, and a bird identification book make a welcome basket. 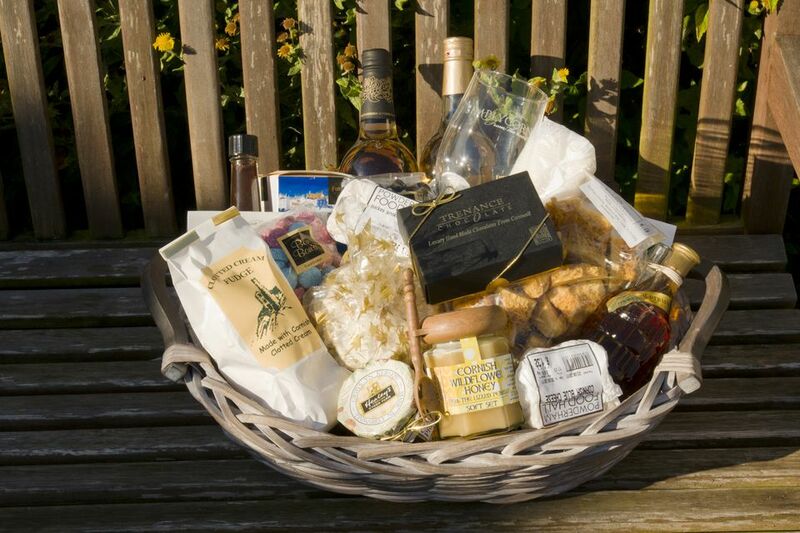 For a new cook (or a seasoned one), fill a basket with basic kitchen tools and/or gourmet treats. Arrange all the items inside the basket. Place a cloth napkin or paper doily in the bottom. Ensure that breakable items are secured or wrapped in cloth or tissue to prevent breakage. Position the tall items in the center with medium-sized items on the outside and small ones in-between. Individually wrapped candy sprinkled throughout the items adds a nice touch. Cut 2 yards of cellophane—plain or special occasion printed—and place it on a table surface, right side down. Place the full gift basket in the middle of it. Gather up the cellophane, pulling up the short sides first, then the longer ends, and secure with a long twist tie. A helper is great for this step. Add the ribbon, making a nice bow with long curved tails or attach a ready-made bow. No need to remove the twist tie unless it shows. Attach the gift tag with string or tape it to the front of the cellophane. If one of the short sides of cellophane is gaping, you may be able to adjust it by pulling gently on the top section. Otherwise, secure it with a small piece of clear tape. Cellophane is sold in rolls that are clear, colored, printed or festive. The clear with a small gold pattern is versatile for any occasion. Ready-made bows are great for taking the hassle out of making one, but make sure that the size is right for the basket. A large basket requires a large bow. Likewise, don't hide a small basket with an oversized bow. Other items can be used instead of a basket, such as a casserole dish, pie plate, serving bowl, or gift box bottom. If the basket or container has low sides, you may require a helper to gather up the cellophane.